Want to know how the Norwood, Massachusetts real estate market is doing? 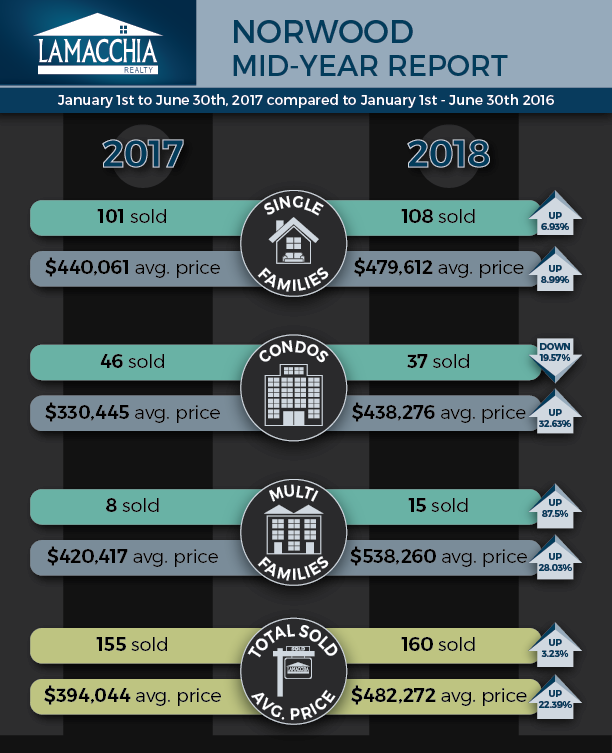 In this Mid-Year Report, we’re looking at home sales in Norwood for the first half of 2017 versus the first half of 2018 and how the market is currently performing. As of June 30th, a total of 160 homes sold in Norwood at an average sale price of $482,272. (These numbers include single-family homes, condominiums, and multi-family sales combined). The number of home sales is up 3.23% from this same time-period in 2017 when 155 total homes were sold. Prices increased year over year by 22.39% from $394,044 in 2017. From January 1st to June 30th, there were 205 homes listed on the market, up 16.48% compared to 176 within the same date range in 2017. There were 188 homes that went pending in Norwood from January 1st to June 30th, which is up 5.03% from 179 homes pending in the first half of 2017. The Norwood market is doing well this year, considering the patterns we’ve seen overall as shown in our 2018 Mid-Year Report. The number of sales and prices increased as well as the number of homes pending and listed, which also showed significant increases in this time frame. The rest of the summer market looks like it’ll be a strong one for Norwood.